The lack of distinct seasons in Singapore makes me feel as though I am on an extended summer break. The signs of fall are replaced by a perpetual cycle of humidity and hence, sweat. Although I miss the crisp autumn air and crunchy leaves of Montreal, I know that that means a brutal winter is right around the corner ready to pounce like donkey kong, so I would choose the tropics over the tundra any day. It's been a while since I've published an outfit post. To be honest, a large reason for this lack of OOTD's is the simple fact that I wear more or less the same thing everyday. I definitely under packed in terms of my wardrobe for exchange, and the heat changed my outfit constructing priorities from looking cute to wearing as less clothing as possible. A flowy dress like the one I have on here (s/o to Kath for letting me borrow this like twice a week) meets both criteria of looking presentable and reducing body temperature. 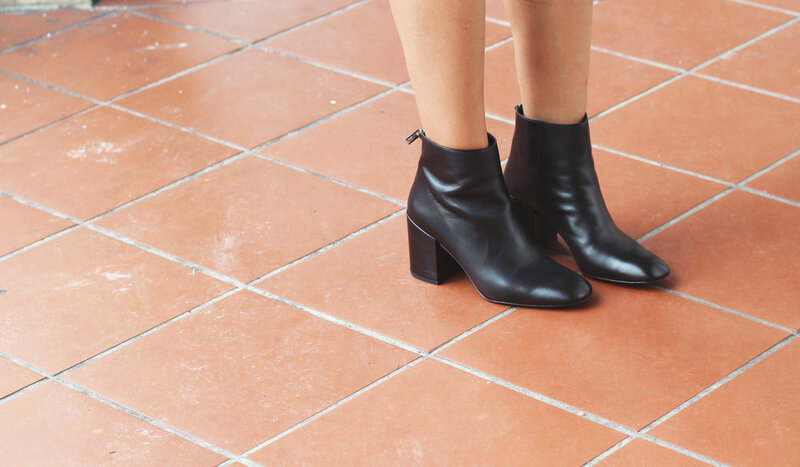 Add a statement purse and killer booties, and you're good to go. The LBD strikes again.